Division of Natural Sciences and Mathematics, University of the Philippines Visayas Tacloban College, 6500 Tacloban City, PHILIPPINES. Introduction: Cinnamomum mercadoi is a medicinal tree endemic to the Philippines. Cinnamomum species have been extensively studied for their endophytic fungi with pharmacological importance. This study aims to isolate and evaluate the antibacterial activity of endophytic fungi associated with the bark of C. mercadoi. Materials and Methods: Endophytic fungi were isolated from surface sterilized bark samples aseptically. The pure isolates were identified through their morphological characteristics. Agar plug diffusion assay was employed in the primary screening of their antibacterial activity against Staphylococcus aureus, Bacillus cereus, Escherichia coli and Pseudomonas aeruginosa. 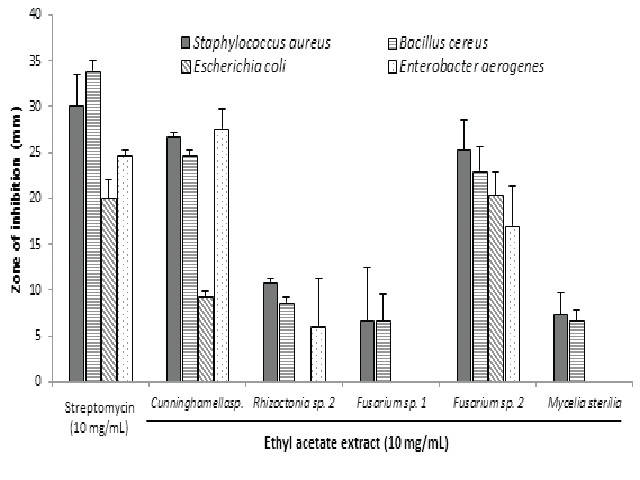 Four active endophytes were fermented and extracted with ethyl acetate (EtOAc). The antibacterial activity of the EtOAc extracts was screened using the disk diffusion assay. The minimum inhibitory activity (MIC) was evaluated using the microdilution method. Results: Twelve (12) endophytes were isolated from the bark of C. mercadoi. All endophytes exhibited antibacterial activity on at least one of the test pathogens. However, only two of the four endophytes subjected to the secondary screening showed wide-spectrum activity and inhibited the growth of all test bacteria. Fusarium sp. 2 was identified to have the most promising activity with MIC values ranging from 2.1 - 4.2 mg/mL. Conclusion: C. mercadoi harbors endophytes, particularly Fusarium sp. 2, which possess antibacterial activity and thus a potential source of antibacterial compounds. Antibacterial activity of the ethyl acetate extracts of Cunningamella sp., Rhizoctonia sp., Fusarium sp. 1, Fusarium sp. 2 and Mycelia sterilia using the Kirby-Bauer disk diffusion assay. The size of the disks is 5 mm. Data are shown as mean ± S.D. (n = 3). Marcellano JP, Collanto AS, Fuentes RG. Antibacterial Activity of Endophytic Fungi Isolated from the Bark of Cinnamomum mercadoi. Pharmacognosy Journal. 2017;9(3):405-409.